It's a gritty crime story straight out of Hollywood. Two seasoned, experienced NYPD detectives went dirty and worked for the mob for a period of years, all while wearing their gold shields. They personally carried out murders, and provided confidential info that led to other killings and helped high level mobsters evade capture. They were finally brought down and convicted years later. 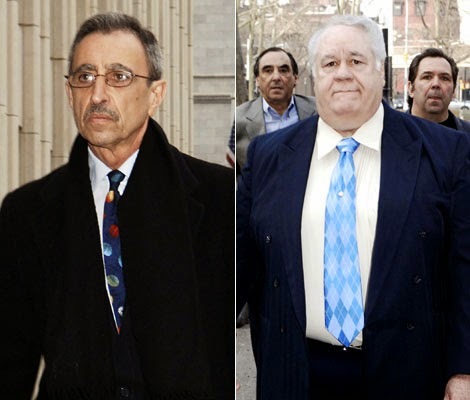 In 2006 and 2007 their victims filed various lawsuits against the City of New York and the two detectives, Louis Eppolito and Steven Caracappa, under state and federal law, based in large part on the City's failure to discipline Caracappa when he was caught passing confidential police documents to a known member of the Mafia way back in 1985. Ultimately, the detectives were convicted in the United States District Court for the Eastern District of New York of various crimes, and their conviction was affirmed in 2008. The actions were consolidated and assigned to the Hon. Raymond J. Dearie, a former prosecutor himself and a longtime judge. Last week, Judge Dearie denied the defendants' motion for summary judgment on the federal claims. The state claims were dismissed, but the plaintiffs will have their day in the court. For those of you that enjoy crime novels and the like, you really ought to read the opinion, which follows after the break at the bottom of the page. The decision is also useful to practitioners as it addresses both claim accrual issues (i.e., why these claims are not time barred), and Monell liability. For the casual reader, municipalities aren't normally liable when their officers deliberately engage in criminal activities. Certainly, as a matter of law, unlike private sector employers, they are not vicariously liable even though these are on the job acts. Rather, the plaintiffs needed to point to some policy or executive action from which the underlying actions sprung, or evidence that the city was deliberately indifferent to the possibility that its officers were engaged in misconduct. A tough task indeed. I won't go into too many of the details. But the key moments in the civil case (to explain why the City could be liable now for things that happened in the mid 1980's) first occurred in April 1984, when the FBI found 36 confidential NYPD Intelligence Division reports at the home of Rosario Gambino, a mobster then under indictment for heroin trafficking. As the Court notes, "the reports included diagrams of family trees, surveillance reports, and the criminal records of reputed organized crime figures." The NYPD's Internal Affairs Bureau investigated, and ultimately concluded that Eppolito had taken the documents, photocopied them, and given the photocopies to Gambino; a position supported by the presence of Eppolito's fingerprints on the documents recovered from Gambino. The only possible explanation for Eppolito's prints being found on these copies is that he had handled them, something he had previously denied. Ultimately, Eppolito was suspended and brought up on charges. But, as Judge Dearie explains, the hearing was highly unusual, and not in a good way. By all accounts, the trial (which is prosecuted within the NYPD by department lawyers) was somewhat of a farce, beginning with the assignment of the case to lawyer who was far too junior to handle the case. Moreover, the case was tried solely on stipulated facts, meaning that no witnesses were called. This was an unhappy surprise to the IAB investigator who sat outside the trial room for the duration of the case, waiting to be called to testify. As Judge Dearie points out, "even more perplexing — indeed, startling — is the fact that the stipulations omitted much of the evidence against Eppolito," including the most damning evidence that the documents at issue were photocopies bearing his prints. Other critical evidence was withheld, and, after Eppolito's lawyer made a series of factually inaccurate and misleading statements in closing, the NYPD's junior counsel declined to respond, offering no closing argument at all. Not surprisingly, Eppolito was cleared of all charges. Hugh Mo, the hearing officer, immediately declared from the bench that he would recommend to Commissioner Ward that Eppolito be cleared of all charges. Five days later, Mo recommended to NYPD Commissioner Ben Ward that Eppolito be adjudged not guilty, reimbursed for pay and benefits, and restored to duty. As Commissioner, Ward had the authority to overturn Mo's findings, order additional investigation, or modify the result, and had done so in previous disciplinary matters. He was an attorney and had extensive experience with the disciplinary process prior to becoming Commissioner. He had served in the Department Advocate's Office and tried disciplinary cases. He had also presided over disciplinary hearings as a Deputy Trials Commissioner. Despite this wealth of experience, which presumably would have alerted Ward to the strange nature of the hearing — particularly the absence of live testimony, the inexperienced Department Advocate, and the lack of closing arguments — he approved Mo's recommendation on April 11, the day after he received it. Many people within the NYPD remained convinced of Eppolito's guilt, including the Chief of Detectives and members of Internal Affairs. Yet, within days of Ward's decision to clear Eppolito, Mo told reporters that the detective "epitomizes the finest of the Department and is the unfortunate victim of circumstance." Worse still, in 1987 Eppolito wrote to Ward, requesting a promotion to Detective 2nd Grade, citing the trauma of the prior prosecution. It was granted. Later, an IAB investigator referred to that decision as "a slap in the face." Sometime in 1985, Eppolito began working with members of the Lucchese crime family, and pulled Caracappa into his scheme. Over the next several years, into the early 1990s, the duo engaged in murders, and used Caracappa's access to high-level investigations to access information and documents, all of which was routinely provided to senior members of the Mafia, including Lucchese underboss Anthony "Gaspipe" Casso. In 1994, Casso began cooperating with the feds. Although the cops' names surfaced, the government couldn't make a case. But in 2005, another mobbed up buddy began cooperating, and suddenly the jig was up. They were indicted in March 2005 and convicted in April 2006. The civil cases were filed in 2006 and 2007, and concerned murders and acts that occurred nearly 30 years earlier, decades past the three-year statute of limitations for §1983 actions in New York federal courts. Not surprisingly, the City moved for summary judgment, arguing that plaintiffs could not prove that the cops' conduct was attributable to a city policy, and that the claims were untimely. Rejecting the latter argument, Judge Dearie elected to apply the diligent discovery rule, which essentially states that a cause of action accrues when the plaintiff first knows or has reason to know of the injury or the facts that would give rise to the claim. Noting that newspaper reports from the 1980s and 1990s did not put the plaintiffs on notice of anything more than the murders in question were mob-related, the Court concluded that plaintiffs first learned of the cops involvement in 2005. The Court resolved the Monell question by determining a jury could conclude that the City's abject failure to supervise it's officers, reflected in the farcical disciplinary proceeding against Eppolito, was the proximate cause of the detectives' subsequent crime spree. This is enough to get this issue to trial. I heartily recommend the decision for all aficionados of true crime stories, Mafia tales, or civil rights litigation.